Gilles Deleuze and Felix Guattari taught us “the unconscious is a producer and its product is real” in their influential work: Anti-Oedipus: Capitalism and Schizophrenia. Gregory L. Ulmer, in Internet Invention, gives readers a map to explore, invent, and discover the electracy lurking in the shadows of their mediated lives. When readers embark on this journey, they learn to tap into their unconscious and find out what their intuition is really made of. As readers explore these four areas, they look for commonalities – taking note of which surfaces, images, words, or feelings recur, repeat, or reappear in their memories. The emphasis is on the atmosphere or mood that readers extract from their memories – what is felt is paramount. In part, this is why Roland Barthes’ articulation of the punctum is crucial to electracy. In Camera Lucida, Barthes differentiates the studium, the socially determined meaning, with the punctum, the tear or puncture that disrupts the experience. As we explore the four areas of that constitute the mystory, remember to look for the punctum in your memory. The first stop in creating the MyStory is narrowing in on a core scene that influences the individual’s life trajectory. Ulmer believes every person possesses a wide or guiding image that is usually made up of four or five primary images. Once the individual narrows in a significant image, they can ask themselves a series of questions to refine and rework their discoveries. Ulmer explains the importance of describing the verbal and pictorial images and how this method becomes a positive ordering operation. This exercise continually extracts the obtuse or third meaning that was always there but perhaps the signifier was flickering, floating, or even repressed. Echoing Eric Havelock’s work in The Preface to Plato, Ulmer explains the notion of the self was solidified in the turn from orality to literacy. Electrate people, on the other hand, do not experience their being as selfhood. Homesickness often manifests itself through our desires for the mood that space and the comfort that the relationships of our mothers and fathers provided. At other times, this desire is transferred to stand-ins for our parents or might even be disrupted by the cognitive dissonance that keeps us from a narratological understanding of our memories, which contributes to absent-mindedness. In other words, that yearning for home keeps us from the here and now. Ulmer then pivots to the concept of the chora to help readers conceptualize the space between being and becoming. The chora was first conceived of in Plato’s dilalogue, Timaeus.The metaphor became necessary as culture moved from orality to literacy with the articulation of the self. This liminal space is often a point of vulnerability, but it is also where we tap into the sublime. The process of confronting the third institution requires readers to analyze the experiences that make up the material of our intuition. It is important to emphasize that considering these images is not merely to tap into new analyses but to new feelings. 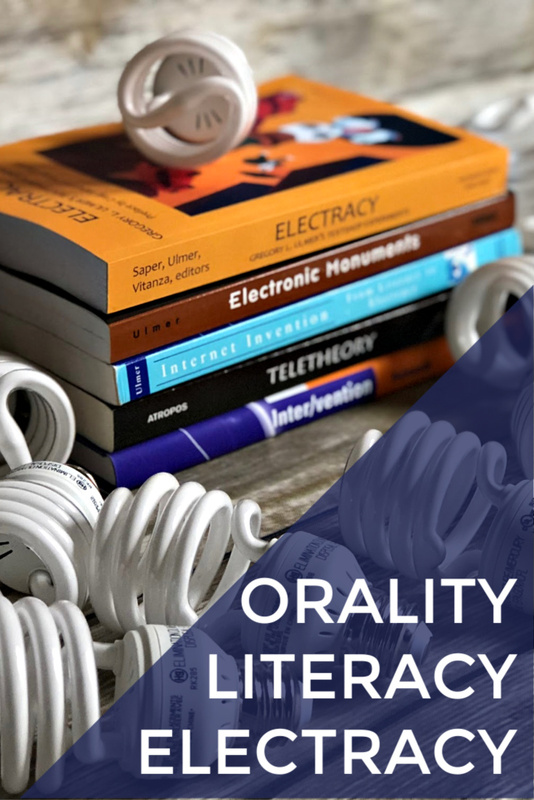 If “a literate person reasons on paper, an electrate person feels online.” Following orality and literacy, electracy celebrates the possibility of writing the unconscious. In the final space, readers interrogate the collective stories told in their national, religious, racial, ethnic, and cultural communities. This exercise relies on the ability to detach signifiers from signifieds and prompts readers to re-examine everything from power structures to ambiguities. There is no ontological link between language and reality. Communities that are made up of individuals, thrive in the gap by creating metanarratives to reduce the anxiety that stem from confronting the unknown. Once we realize this, and we begin to embrace the gap, we will begin to operate as what Agamben calls a “singularity” rather than a “self.” In other words, we’ll learn to behave as an image. We’re reminded again of the wise nugget offered by Deleuze and Guattari: the unconscious is a producer and its product is real. The unconscious is a producer, and its product is real, but the self is an illusion, and the singularity is near and transports us in time and space.